Electromagnetic Cross Belt & Inline Separators for High Performance and Hi Volume Separation requirements. Ø IN-STOCK Ready to Ship Models: 30 to66″ Square Electros covers 85% applications while other sizes are available and manufactured as needed. Ø Hi-Intensity Electromagnetic Separators – Exclusively vacuum impregnated coils for higher operating strength and greater heat dissipation performance. 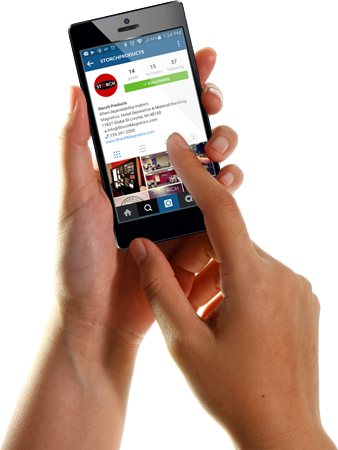 Ø TWO-Versions of Cooling: Exclusive Oil Cooled Expansion or Air-Flow-Cooled. Ø Many Option(s): Power Pack Control, Temperature Indicator, Hoist & Trolley to facilitate Magnet Gap suspended adjustment over your existing conveyor. 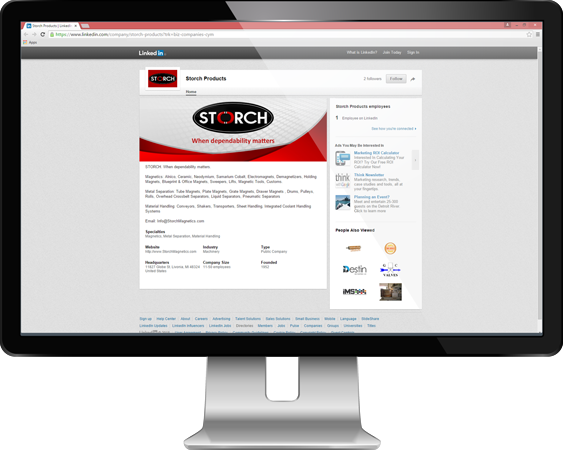 Non-Ferrous conveyors are also available from Storch as needed. 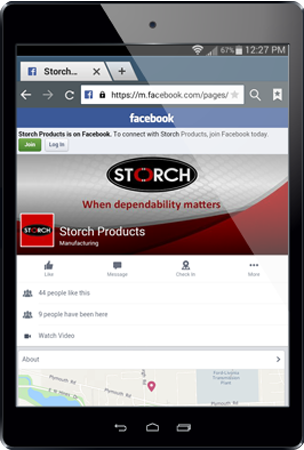 Storch assists all types of demanding industries and processors of steel, scrap, mining, quarry stone, recycling metal, tires, paper, plastics and food industry processing having something in common. Industry requires a Higher Energy Separator removing and/or separating ferrous materials of all sizes from product or recycle streams on belt conveyor systems, slide troughs or vibratory feeder conveyor transporters with non-ferrous trays. Electric Magnetic Separation by Storch accomplishes easy removal process through the use of magnetic separation technology utilizing a heavy duty industrial electro magnet without or with a Storch self cleaning ruggedized industrial durometer belt. Using an electromagnetic separator circuit/element creates deep penetrating magnetic flux or fields lifting out ferrous particles from product streams to Storch overhead or Inline belt separator. 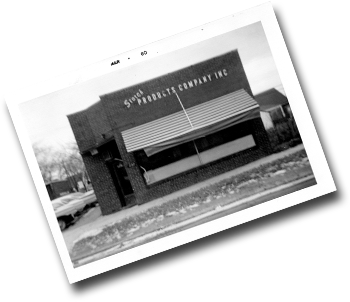 Established in 1952; Storch’s expertise helps industries with a full line of suspended magnetic separators in various sizes & three styles – no belt, an automatic cleaning cross belt and automatic cleaning in-line belt using an electro magnet air cooled, oil cooled or various separation performance magnet systems. All styles feature heavy-duty construction with either copper (optional) or aluminum coils standard for electromagnets. Exclusive is standard coils are vacuum-impregnated which offers stability, strength and heat dissipation for extended service life. 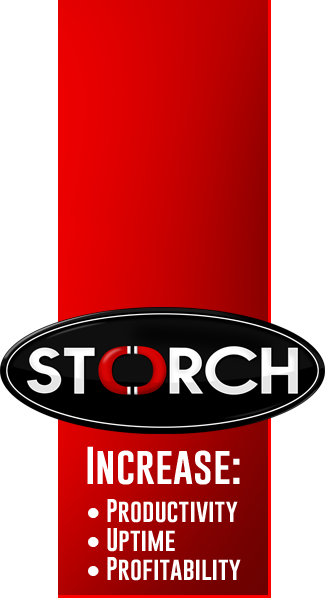 Also Storch’s oil cooled electromagnet units feature an external expansion tank allowing rapid heat dissipation giving the electromagnet a dependable high performance throughout its service life. Storch electromagnetic separators use direct current charging the magnet. The separator is placed over a conveyor where it attracts any type of ferrous material from a product stream lifting it away from the media when properly sized for flow rates, depth, density and a few other variables to perform efficiently. A suspended electromagnet or permanent magnetic plate without belt may also be easily installed over a conveyor belt without any need to change the existing conveyor’s position. Suspended over your conveyor line, either parallel to it or at an angle at the discharge point, it can easily pull ferrous materials from the stream. To clean the electromagnet plate without belt, it’s simply pulled away from above your conveyor, and its power turned off causing the ferrous material to fall off. Whereas a Permanent plate magnet requires manual release of occasional tramp metal, while great volumes of metal removal is when an auto clean belt with pulleys should be applied to applications. Advantageous of an automatic cleaning cross- or in-line belt electromagnetic separator is your below conveyor belt need not be stopped for magnet cleaning. Ferrous materials are continuously cleaned from the belted magnet separator using a paddle or cleated self-cleaning belt. 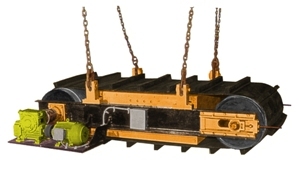 Ferrous materials are then dropped aside into a receiving hopper at the side of the existing conveyor as discharged from the magnet by cleats on the moving inverted belt. 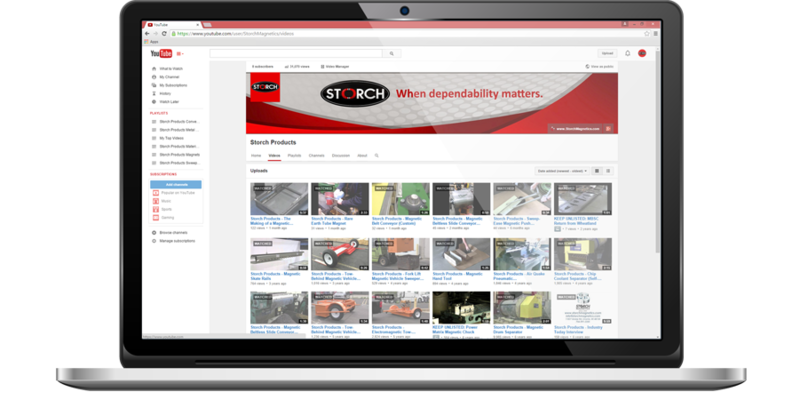 Storch Magnetics offers in stock systems for immediate delivery on many popular models covering 80% of the range that customers use with cross- or in-line belt sizes from 30 to 66 inches, while other sizes are available to order. 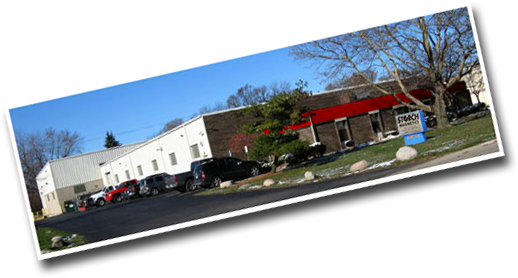 Companies interested in magnetic separation systems and automated material handling should consult with Storch engineers who will provide value added selection, installation recommendations, and a free quote on an appropriate electromagnetic or permanent separator best to fit your application separation requirements.